Long-lasting and easy to use, our Naturally Nuts™ No-Melt Suet Cylinders contain peanuts, rendered beef suet, corn and oats. Simply place the cylinder in our Decorative Seed Cylinder Feeder or Dinner Bell Feeder and watch a variety of perching and clinging birds, especially woodpeckers, enjoy. 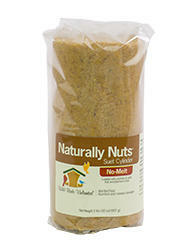 Our Naturally Nuts™ No-Melt Suet Cylinder is an easy, long-lasting way to offer a high-energy, high-fat food to your birds. Avoid the mess of melted suet. Offer No-Melt Suet when seasonal temperatures are above 95º F and Suet when temperatures are below 95ºF. No-Melt Suet is rendered and refined to remove impurities that cause spoilage, and it's designed to withstand temperatures up to 130° F.